When we visited Taiwan in August 2018 – our first ever trip to Asia together – we fell in love with the diverse cuisine of the country. Taiwan has had a plethora of varied influences over the centuries, from Spanish and Dutch rule to Chinese and Japanese more recently. In the present day the country is a melting pot of many nationalities, and this is reflected in its eclectic cuisine that’s continuing to constantly evolve. Taiwanese cuisine, we found, is heavy on garlic, not too heavy on chilli (which might surprise some people), pork reigns supreme and vegetables are in abundance in dishes. 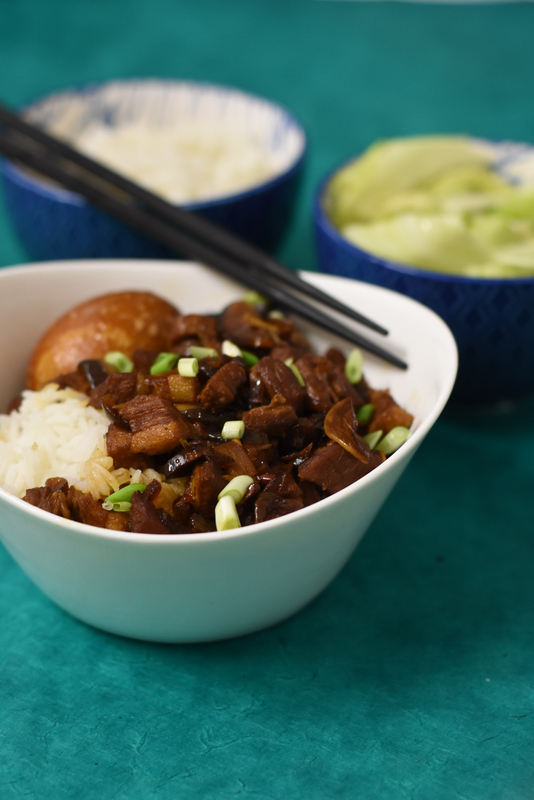 This dish, Braised Pork on Rice, is one of the most iconic dishes in Taiwanese cuisine and it’s available across the country. This was probably amongst our favourite dishes we tried when we visited and we couldn’t wait to get back home and try our own spin on it. This is as close as we could come to the authentic original and this put a huge smile on our faces when we put chopsticks to mouth and tasted our recreation as it transported us back to that amazing week spent exploring the island and its incredibly unique and delicious cuisine. This dish may take a little work, but it’s worth it – promise! If you’re looking for a star dish for a weekend celebration or something to keep you busy in the kitchen before an evening in front of the TV, this is it! 1. In a wok, heat a tbsp of flavourless oil until shimmering. Add the pork cubes and cook the pork until it’s just about turning golden and its rendering its fat. At this point, add the sliced onions, garlic and ginger and stir everything together for a minute or so more. 3. Allow the pork mixture to come to the boil and then reduce to a gentle simmer for 60 minutes, up to 2 hours depending on your pot, the size of the pork and the amount of liquid. 30 minutes before it’s done, pop in the hardboiled eggs – they will be tinted by the sauce and warmed through. 4. Cook the rice as per packet instructions until just cooked through – you don’t want it to be overly sticky or mushy. 5. When the pork is done – tender and flavoursome, sauce thickened and seasoned to your preference – quickly cook the cabbage/water spinach. Heat a little oil and butter in a saucepan and when hot add the cabbage. Turn the heat down to medium and clamp on a lid to allow the cabbage to steam. After a minute, add the garlic slices and return the lid. Allow these to cook together for another minute or two before taking off the lid and giving a stir. The cabbage and garlic should be both soft and sweet, slicked in savoury buttery juices. 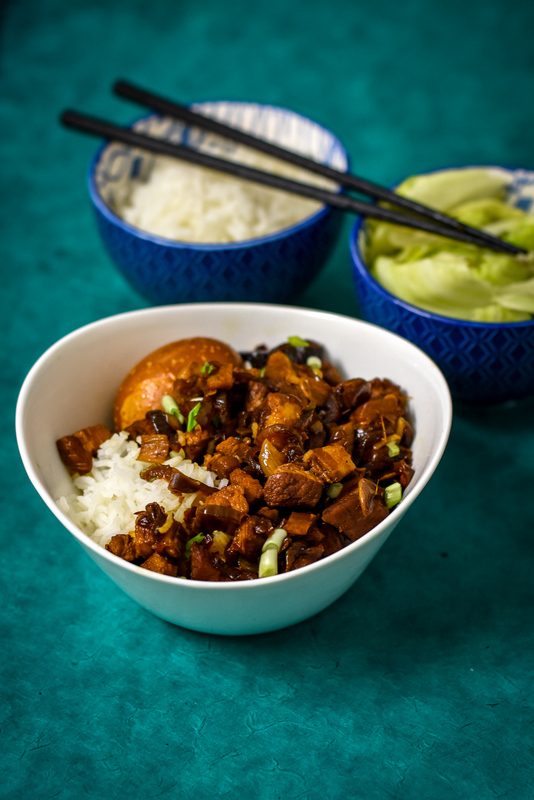 Serve immediately in a side dish or alongside the pork on top of the rice. 6. 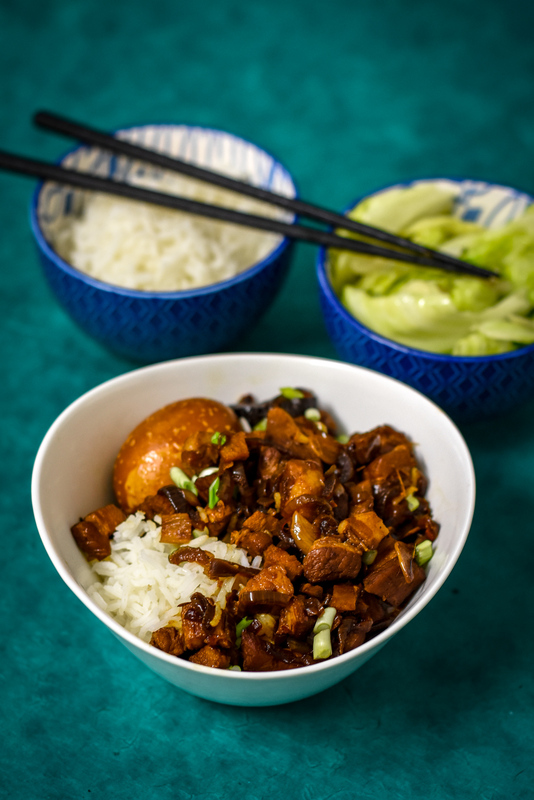 Serve a generous spoonful or two of the pork mixture on top of a small mound of rice in a bowl. Eat with chopsticks and savour every single mouthful. A recipe that’s worth every ounce of effort and every minute of time.